The weekend just flew by! It didn’t even dawn on me that the weekend was over until it was 9 and I realized I had missed West Wing (no worries, it was Tivo’d). This was by far my favorite MDSW. I think you need a couple years practice before you get it right. This year went really well. Christy* and I arrived at 9:15. On the way down we strategized who to hit first (Tess, since she’s close to the entrance), then Socks That Rock (I mean, The Fold), and then there were a few more we wanted to hit but knew we could go at any point — Brooks, Spirit Trail, Kimmet Croft, Morehouse. We missed Kimmet Croft (were they even there?) but we made it to the rest. Tess’ was as crazy as you’d expect. The Fold (at what? 9:45) was out of most colors already. I’m glad I wanted solids because there was slim pickins for the multi-colors. I got to meet a few new people too — Isel who looked so cute in her orangina, Kate (it only took 2 MDSWs to actually meet! ), Lolly who is doing fabulously with her diet, and the money-raising queen herself — Claudia. Only buy things that are hard to buy online/in-person during the year. No crazy-dyed sock yarn because I enjoy knitting stitch-patterned-socks a lot more than stockinette/ribbed socks. Don’t buy a big quantity for a sweater because I won’t use it for at least 5 months and at that point it will become “old” anyway. Pink and white striping yarn for a simple scarf. This was my splurge purchase but I thought it would be fun to knit and wear. The booth was full of EZ-style yoke sweaters knit up in their colorways. 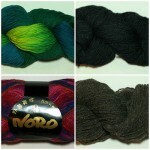 The yarn is like a Trekking in that it’s a 2 ply and each ply changes color on its own, creating subtly changing stripes. I can’t remember their name but they were in the main building in the same aisle as Morehouse (aisle B). Tess sock yarn – White with bits of gray. 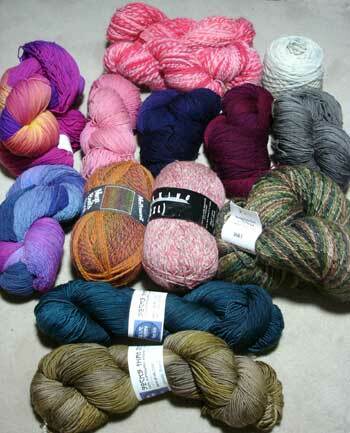 These are all Tess sock yarn. The first is 2 hanks to make my mom a pair of Jaywalkers. She loves mine and wants a pair, but get this — in knee highs. I think I know how I’ll do the increases but this will be a labor of love. I don’t think I’ve ever knit a pattern twice. Morehouse Laceweight Quad hank (4 oz) for a Melody Scarf. Megaboots sock yarn. I’ve heard great things about this and none of my LYSs carry it. 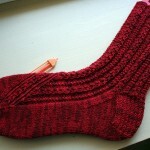 It’s regular sockweight (8 spi) and has elite in it so it’s stretchy. Trekking in a muted pink palette. I love my Rainy Day Socks and wanted another Trekking to do something similar. Brooks Farm Duet in my favorite greens. I really splurged on Tess’ but her yarn has held up better than any other socks I’ve made, so I think it’s worth the splurge. The only thing I wish I had gotten was a mega-hank of handdyed laceweight, but nothing really grabbed me. I’ve been working on a round shawl pattern (I’ll blog about it soon) and I think I’ll need over 2,000 yards. 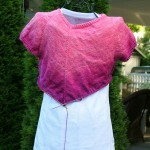 I want something with a little color change because I’ve noticed it makes the knitting a lot less monotonous for me. Any suggestions? Yo! Email me about the laceweight. I might be able to hook you up. You had some fabulous loot! Glad I FINALLY got to meet you both. We do have good time, don’t we! Loved looking at your stuff even though I was there when you bought it all. That’s a fine haul you’ve got there. Great to meet you! Nice to meet you in person! It was great meeting you. I’m glad I ran into you soon after I got there. It was a great start to an already exciting day. Darn, you found the pretty Trekking colorways! Whoa. Not only is the yarn gorgeous, but I just saw the pic of you next to the ginormous yarn, um, hank…how would one ever ball it?? Anyways, I think you should come to Chicago and stay with me during Stitches Midwest in August…looks like you’d be able to teach me a thing or two about fiber shopping! Glad you had a great time! My my, Jody – I was so happy to meet you! Wish we had had more time to chat – maybe next time? You got some gorgeous stuff. I was looking for that fuschia sock weight as Tess, but they must have been sold out by the time I got there. Lucky you! Love that Morehouse colorway you got too. great stuff jody. 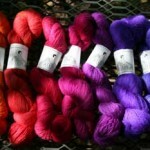 will you knit it all before rhinebeck? I just drooled on my keyboard. And knee-hi jaywalkers?? Yes, please! Kimmet croft was there – in the back of one of the exibition halls – not really in plain view….You got some great colors! Looks like you got some lovely things! Wow! Can I quote you? I’m even tempted to try knitting socks again and I haven’t knit a sock since I made Tess’ Christmas sock almost 20 years ago!